I designed and knit these socks while manning our booth and interacting with folks at the Broad Ripple Art Fair in Indianapolis. The pattern is a deceptively simple ripple stitch, comprised of only two rounds, one of which is a work even round. Using just a few well-spaced increases and decreases, you create a wonderful ripple fabric that looks more intricate that it really is. The yarn also adds to the fun of the sock. Equally beautiful in a solid or variegated, the combination of cotton and elastic means that the knitted fabric can stretch for a larger leg or snug up to a smaller one. Just alter the length of the foot to fit you [or your intended giftee]. A side note: on the first day of the fair, some very rough weather passed through, including a tornado warning and heavy rains. An hour later, the sun was out and the crowds returned, along with television crews. One local affiliate shot close-up footage of me knitting the sock, which ended up on the evening news as a part of their story about the fair and the storms. 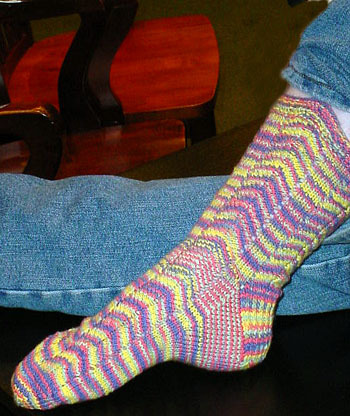 [Knit foot longer or shorter to adjust to the size of the intended recipient]. Cascade Yarns Fixation [98.3% cotton, 1.7% elastic; 186yds[167m] stretched, 100yds[90m] relaxed per 50g skein]; color: 9955-Italian Ice; 2 skeins [a third might be a good idea for sizes greater than US 10]. Note: If you prefer knitting on two circulars, Rob has provided alternate directions in a Word doc. Click here to download. Round 1: *K2, yo, k3, ssk, k2tog, k3, yo, k2; repeat from * around. Round 1:*K2, yo, k3, ssk, k2tog, k3, yo, k2; repeat from * around. Divide sts on 4 double pointed needles [14 on each]. Join in the round without twisting. 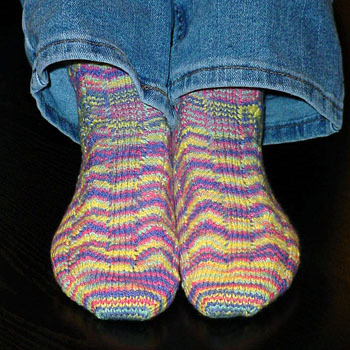 Work in Garter Ripple Stitch for a total of 6 pattern repeats [12 rounds]. Switch to Ripple Stitch and work these two rounds until the entire sock is 7 inches long [or desired length] when measured from cast on edge. End with a pattern round [Round 1]. Slip N2 stitches onto N1 -- 28 sts. Slip N4 stitches onto N3 -- 28 sts. Row 1: *Sl 1, k1. Repeat from * to end. Row 2: Sl 1, purl across. Rw 1: [RS] K17, ssk, k1. Turn. Rw 2: Sl 1, p7, p2tog, p1. Turn. Rw 3: Sl 1, k8, ssk, k1. Turn. Rw 4: Sl 1, p9, p2tog, p1. Turn. Continue shaping the heel as above, adding one additional st in the middle each time [K10, P11, K12, etc.] and decreasing 1 st as directed [ssk or p2tog] until all sts have been worked. End with a purl row. 18 sts remain. Knit across the heel stitches. Do not turn. Using the same needle [N1], pick up 1 st in each edge stitch along the side of the heel flap [the right side should be facing you] for a total of 17 stitches. Pick up 1 additional st in the gap between the flap and the instep sts [those "on hold" since starting the heel flap]:36 sts total. N2 [instep stitches]:knit across:28 sts. N3:Using another [empty] needle, pick up and knit 1 st in the gap between the instep sts and the heel flap. Pick up 1 st in each edge st along the other side of the heel flap for a total of 18 sts [1 in the gap + 17 along the flap]. K 9 sts from N1 onto N3 -- 27 sts total. You are now at the beginning of your round, with half of the turned heel stitches and one gusset on N1, the instep/pattern stitches on N2, and the gusset and the other half of the turned heel stitches on N3. N1: Work to 3 sts from end, k2tog, k1. N2: Cont in pattern by resuming Ripple Stitch pattern from above [round 1]. N3:K1, ssk, work to end. Repeat these 2 rnds until there are 56 sts remaining [N1:14 sts, N2: 28 sts, N3: 14 sts]. Work even, keeping only the instep stitches [N2] in Ripple Stitch until the foot measures 1.5 -2 inches less than the desired foot length [approximately 9.5 inches for a women's US 8 shoe]. N1: Work to last 3 sts, k2tog, k1. N2: K1, ssk, work to last 3 sts, k2tog, k1. N3: K1, ssk, complete round. Repeat these two rnds until 20 sts remain [N1: 5sts , N2: 10 sts, N3: 5sts]. K sts from N1 onto K3. You should now have 10 sts on each of 2 needles. Cut yarn leaving a 5 inch tail. Graft sts tog using Kitchener st.
Weave all ends in on the inside of sock. Rob has been knitting since he was 5, when he was taught how by his maternal grandmother as an attempt to keep him occupied and quiet. It has kept his hands busy for over 34 years, but he still remains rather chatty. 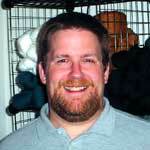 A former university faculty member, he now owns ThreadBear Fiber Arts Studio with his partner, Matt Waldrop, and has been dubbed "Felting King" by Kathy Wortel and others who read BlackDog, his blog inspired by their black Lab, Connor. When given the chance to pick a favorite project, Rob gravitates towards cables and texture and is a big fan of Aran designs, but to balance it all out, he loves a good sock for a quick fix of color and pattern. Please don't ask about his progress in learning to spin. Pattern & images © 2003 Rob Matyska. Contact Rob.